So, in the spirit of Edublog’s efforts to “promote and demonstrate the educational value of social media,” and without further ado, I give you my 2013 Edublog Award Nominations. Best group blog – ASHASphere is a fabulous blog with a variety of writers educating about various things in speech-language pathology and audiology. Truly one of the “go here” blogs for good information in an easy-to-read format. Best new blog – Speech2U is a “new-to-me” blog that I found recently and I am amazed at the information provided there (I think she’s been blogging just over a year so hopefully still “new” enough to qualify). I love the mix of craft ideas, app reviews, and Soapbox rants. I particularly liked the one about writing impossible goals. Best ed tech / resource sharing blog – Sean Sweeney at Speech Techie is the first blog that comes to mind when I think “ed tech” and “resource sharing.” His blog is easy to read, informational, and full of relevance for those working with tech in schools. Best teacher blog – Ruth Morgan’s Chapel Hill Snippets is as close as I can come to nominating a best “teacher’s blog” in that she’s not specifically a teacher (She’s an SLP), however, she is working with students and teaching them…More importantly, she’s teaching other SLPs how to teach students through the use of printable books, various ipad apps, and many many more. Her Free Materials selection is fabulous and I LOVE how she shares her printable books. Most influential blog post of the year – The Speech Dudes “There’s no such thing as a ‘free’ app, so get over it and pony up!” post was by far and away the most influential for me. Not only did it support my own viewpoint of free apps aren’t always best, it drove home WHY apps cost money. Best twitter hashtag – #SLPeeps without a doubt is the best twitter hashtag. We have grown into a multi-cultural community with one intent – helping others. Best free web tool – LessonPix SoundFinder has to number among the best “free” web tools out there. The Sound Finder allows the user to plug in a word, pick a phoneme, and it will automatically bring up a ton of words with that phoneme in them. It will also find rhyming words, minimal pairs, etc. Use of the full website requires a small fee per year; however, there is no membership fee associated with the use of the SoundFinder..
Best educational use of audio / video / visual / podcast – The A.T.Tipscast is a great source for helpful tips and an interesting take on professional development and technology designed for students with special needs. I really liked Chris’ post comparing creative professional development with a zombie apocalypse. Best educational use of a social network – Rachel Wynne over at Gray Matter Therapy has created a monthly “Research Tuesday” where a group of bloggers write journal article reviews on their own blogs and Rachel compiles them all into one handy place for perusal. Best mobile app – Smarty Ear’s Articulate it! is the first thing that comes to mind when I think mobile app. This app is one that I use every single day that I’m at work. I love the data compilation, the pictures…everything. Even though I am an app author with Smarty Ears – this is NOT an app that I authored. Lifetime achievement – http://speech-language-therapy.com/ Caroline Bowen is a fantastic resource and has been a creative force on the information highway for a long time. 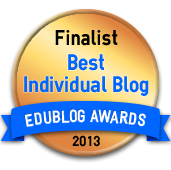 Interested in nominating your own EduBlogs? Go for it…You can find the info here. I can’t wait to read your nominations! Thank you for your nice words. You have a fabulous blog too! Mary-Thank you so much for the nomination! I feel so honored. Ruth from Chapel Hill was a great addition too! Her printable books are fantastic. Thanks Kelly. I stumbled across your blog a while ago and fell in love. Yay! Thanks for nominating Research Tuesdays! I just wanted to thank you for nominating and voting for the A.T.TIPSCAST! I really appreciate it! Please keep up the great work! I was happy to! You do great work Chris.